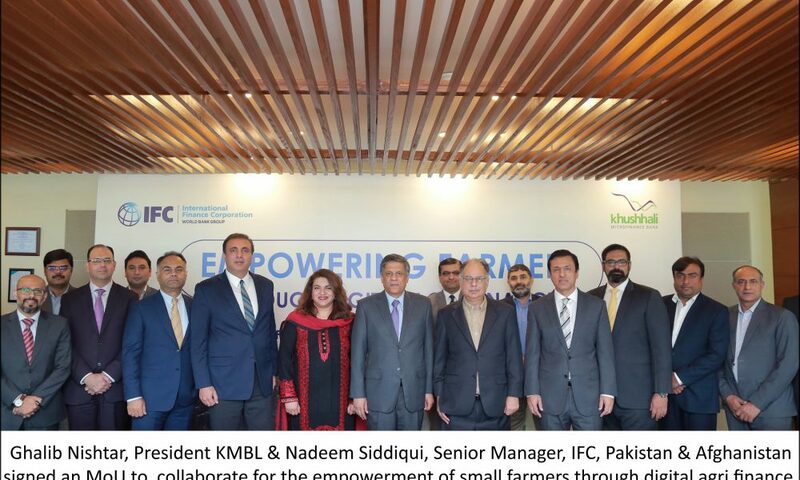 Khushhali Microfinance Bank and IFC, a member of the World Bank Group, have agreed to enter into an advisory engagement to support the development of an agri-digital scorecard to accelerate financial inclusion and access to finance for low-income farmers in Pakistan. This collaboration embodies the commitment from both institutions to support small landholders that are not in the radar of conventional banking ecosystem, thus facilitating the creation of a more resilient farming segment across the breadth of the country. This collaboration will leverage IFC’s global experience in developing such scorecards in various geographies across Latin America, Africa, and Asia. Notably, the project will benefit from IFC’s most recent experiences in China where IFC’s engagements have successfully ramped up outreach through large-scale institutions such as Bank of Langfang and Postal Savings Bank of China. In addition, the project will leverage Khushhali Microfinance Bank’s recently upgraded technology platform, T-24, which, with its optimal capabilities is amongst the best in the world. “Agri digital finance is a key priority for IFC globally, and, through this engagement, IFC will leverage its global experience to unlock the potential of small farmers using technology solutions. The eco-system in Pakistan is ripe for such an engagement and in Khushhali Microfinance Bank, we have a committed and capable partner in this innovative and transformational journey”, said Rachel Freeman, Manager Financial Institutions Group, Asia and Pacific. Khushhali Microfinance Bank is a forerunner in the microfinance sector in Pakistan. As the largest microfinance bank in the country, Khushhalibank has served over 5 million customers over the past 18 years. Moreover, it was declared the Best Microfinance Bank in 2018. “The collaboration with IFC will further accelerate our endeavors to support the agricultural base of our country. IFC has been a long-standing partner in other areas as well and helped Khushhalibank develop the first microfinance housing offering,” said Ghalib Nishtar, President of Khushhali Microfinance Bank. IFC is a leading development finance institution and functions as part of the World Bank Group to spur private sector activity through investment and advisory across the Globe. IFC has played a leading role in supporting Agri-digital practices by collaborating with selected practitioners that can help towards the cause of financial inclusion. Pakistan is a priority country for IFC.